St. Sigma is a hands-on case study for process improvement training. Based on the successful results of an actual hospital lab project, St. Sigma is a data-rich learning tool that instructors can use to teach process improvement concepts in a risk-free environment. St. Sigma is a data-rich, virtual case study and instructive simulation for the classroom where students learn process improvement tools in the context of completing a realistic project. 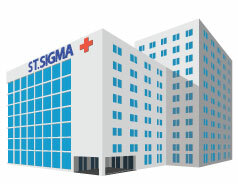 If you need to provide your Champions, process owners, and Belt students with a solid foundation in process improvement but lack the time to build a realistic, healthcare-based case study from scratch, then St. Sigma is for you. A complete, end-to-end case study - for Lean Six Sigma or general process improvement programs. A realistic virtual lab - where your students can safely explore, experiment, and practice teamwork. A comprehensive experience - that you can use to demonstrate dozens of statistical tools and techniques. A flexible learning tool - that can be sized to meet your teaching objectives and time frame. A customizable project - that you use for a diverse audience, from beginner to advanced. St. Sigma Hospital is facing a serious quality issue: the turn-around-time for lab tests is far too long, especially for "stat" orders. Based on a project from a MoreSteam customer, St. Sigma delivers a realistic experience from the initial problem definition through to the final implementation of improvements. St. Sigma is ideal for internal instructors and for consultants who need a realistic, relevant and data-rich case study but lack the time, technology or resources to develop one. If you need to train students in a healthcare, hospital or lab setting, then St. Sigma will provide you with a flexible, affordable training tool that you can easily incorporate into your existing program. With St. Sigma, you'll receive a comprehensive, end-to-end online project complete with an instructor version that includes teaching tips and solution files. How Can You Use St. Sigma? St. Sigma is not prescriptive: you can customize the pace, order, and depth of content to suit whatever level of mastery you wish your students to receive. Unlike MoreSteam's other training simulations, St. Sigma is not a game where teams work independently or compete on a simulated project. St. Sigma is an immersive teaching tool where your class learns in a unique, comprehensive and realistic online environment. St. Sigma begins with a background story involving St. Sigma Hospital, which is facing a serious quality issue: the turn-around-time for lab tests is far too long, resulting in severe customer dissatisfaction. In particular, the process excellence team has decided to focus on the cycle time of glucose testing, a high-volume analysis that should be quick to perform. As students enter the simulation, they interact with a visual, online process map of a medical lab. The top menu is laid out in a DMAIC (Define-Measure-Analyze-Improve-Control) order. Each project phase offers several options (activities) supported by data sheets, templates and teaching lessons. St. Sigma contains 27 different activities, from creating a Project Charter to Balancing Capacity, and only requires Microsoft® Excel®. As students work through the activities, they begin to learn how to correctly apply the tools and templates of Lean Six Sigma to improve patient care and reduce operating costs. They learn critical thinking skills and how the outputs of various analytical tools are linked and used across the phases of the project. As the instructor, you lead the class as you wish, guiding them through the tools and delivering the lessons you feel are most important. You can choose to use St. Sigma for a few hours as a Yellow Belt overview, in a one-day intensive workshop, in small sessions tied to DMAIC phase and spread over weeks or months, or in a few days as a capstone project for Green or Black Belt training. Annotated solution sets for every activity. Teaching tips and coaching suggestions. We license St. Sigma for use by an instructor on a per instance (class) basis for $750. This fee provides access to the instructor version, which includes the St Sigma simulation along with an instructor guide and all of the solution files. If you would like your students to be able to explore and download files on their own computers, there is a fee to provide them with individual access to the St. Sigma simulation at a cost of $75 per student ($50 per student if licensed along with MoreSteam's e-Learning). IMPORTANT NOTE: We do not allow student enrollments without an instructor enrollment. For a single (60-day) use of St. Sigma to a class of 10 students who do not have MoreSteam e-Learning in their program, you would either pay (1) just an instructors fee of $750 to show it to students while you teach, or (2) a total fee of $1500 (the $750 instructor fee plus $75 for each of the 10 students) so that your students also have full access to the program on their own computers. We also offer an annual unlimited license for $3000 per year, which is licensed on a per instructor basis. This option allows for a single instructor to use St. Sigma on an unlimited basis for one year. Beyond these costs, there is no additional or hidden pricing, because St. Sigma is entirely online, so there are no additional parts, pieces or statistical tools to buy and track. In addition, St. Sigma is analytical software independent, so your students do not have to purchase a specific statistical tool. They can use Excel or can move or copy the data files into EngineRoom®, Minitab®, JMP® or other statistical tool. Is St. Sigma based on a real case study? Yes. We worked with several customers in the Columbus, Ohio area who completed similar projects and then use the data to inform our simulation. Does St. Sigma have a single best solution? No. In the Improve Phase, you have the choice to select among several combinations of improvement options, and each combination delivers a different result. As a learning moment, students can select dissimilar combinations and then compare the effects of their process improvement choices.